For years, we were told that eating fat was turning us all into fatty boombaladas, causing heart disease and sending us to an early grave. And so, everyone turned to the low-fat and no-fat “foods” that flooded the market. But what happened? The obesity epidemic didn’t subside. No, obesity levels have continued to increase with the resulting medical complications now one of the top health challenges of our era. It turns out fat isn’t the public enemy number one we thought it was. Instead, fat is a critical part of our diets. 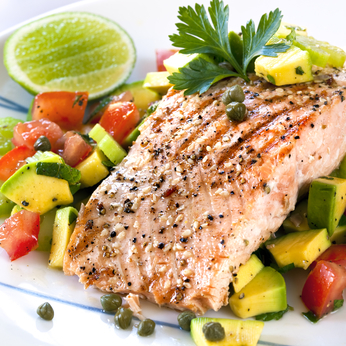 Grilled Atlantic salmon with an avocado and tomato salsa. Delicious healthy eating with GOOD fats! Did you know there is a source of nutrients we can’t get from any other foods or make ourselves. These are called essential fatty acids, and without them in your diet you cannot have good health. It plays a key role in helping our bodies actually absorb nutrients and is used to make many vitamins, in particular Vitamin A, D, E and K. To get the full vitamin hit from your garden salad or your plate of steamed greens, you need to add some healthy fat to your plate. As well as making food good for us, fat makes food good to eat too. This was one of the biggest problems of the low-fat/no-fat dogma, as to make these foods palatable manufacturers needed to replace the fat with something else. What else makes food taste good? 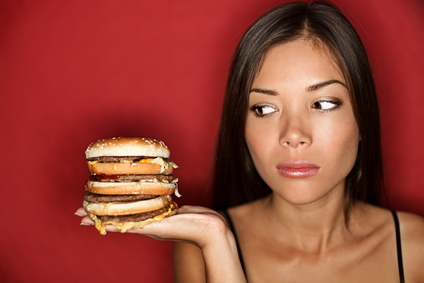 Sugar and salt, neither of which are exactly innocent when it comes to our health. Healthy fats play an important role in improving the liver’s ability to burn fat. Yes, if you want to burn off that unhealthy fat that is around your internal organs, you need to be eating dietary fats to initiate that fat-burning process. Before and after DEXA scans can give you the visual evidence of the results you can get from adding the right fats to your diet. Remember not all fat is created equal.. The important thing to remember is that all fats are not created equal. When it comes to fat, some are very, very good, and others are very, very bad. It’s also important to be conscious of your fat intake as fats are calorie dense foods and need to be consumed with deliberate intent. Be smart and strategic with the fats you eat for maximum health benefit. So, what fats should you be eating? It’s time to stop being afraid of fat and instead, make fat your friend. For so many of our clients, we’ve seen the amazing changes in their body composition from simple diet changes, including increasing the amount of healthy fat they eat. Before and after DEXA scans have shown that this fat loss has been primarily the unhealthy and dangerous visceral fat around internal organs in the abdominal cavity. Have you been fat-phobic in an effort to lose weight? Has increasing the fat in your diet improved your health?